Got home yesterday after our safety meeting and went to the garden and pulled up what was left of my cabbage,(saved what I could),squash,watermelons,and A row of snaps.Then I ran the tiller over it and sowed turnips,mustard,and spinach mustard,and sprinkled it with the hose.It's so dry everything I pulled up had done all it's gonna do,so maybe I'll have a turnip and some greens if it ever rains. Then I went to the store and bought A case-the Ice Road Truckers marathon comes on at 1:00,and the Michigan race too,so I might just sit on my a...uh,tail I mean,and take the day off today. Well I'll be- small world after all I guess!One of the first trucks I drove was A 58 or 59 Ford F-600 with A 4 speed and 2 speed axle.My younger brother,myself,and our friend Mike decided to go into the pulpwood business when Mike's daddy was clearing some land.We figured we'd cut the trees for pulpwood and haul them to A woodyard about 5 miles away and get rich,instead of him just bulldozing them into A pile to be burned later.The truck usually had A cattle body on it,but it was off to haul hay and stuff at this particular time,so it was A perfect pulpwood truck-or so we thought.It still had A flat bed body,and we loaded all the wood ourselves.By hand.It was short wood,5 foot lengths,still green,and very heavy of course.I was about 17,Mike A year younger,my brother a year younger than Mike.We managed to cut and load about 2 loads,maybe 3,then we decided to retire.Back then I think A load payed about 30 or 40 dollars I don't remember,but it was A whole lot of work for the money. 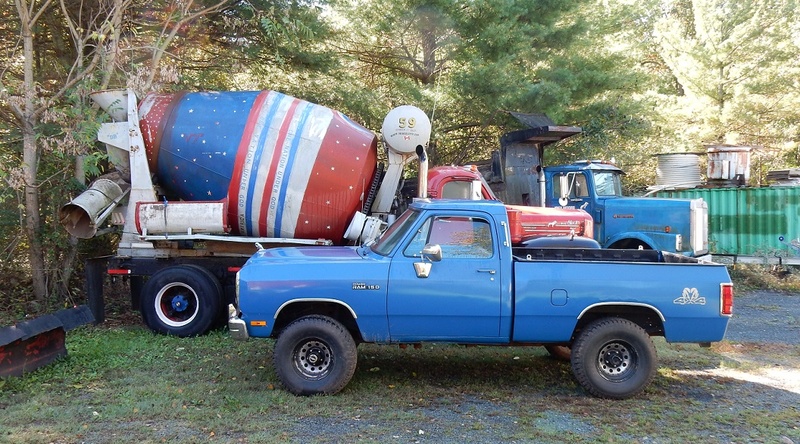 You guys got me started checking out You Tube,now it's on my favorites list.The other morning I was checking it out,listening to A GMC grain truck with A 671 Detroit and a straight pipe,and I came across one called "shifting A Diamond Reo dump truck".It had a 671 too,with a 5 speed and 2 speed rear.Usually I don't even read the comments people make about the videos,but this time I did.Some guy,obviously A youngster,said it was A super ten transmission.I'm pretty sure he was young because he said "dude,I can shift like that without using the clutch".Another guy explained the difference between a super ten transmission and an electric shift 2 speed rear end,with A 4 or 5 speed transmission.And explained it perfectly I might add. Then the first guy said " well,I don't drive an old dump truck,I drive A (don't remember,so and so something or other) Western Star with A 3213 Cat and 18 speed Fuller Eaton pro shift transmission". (his wording) Being the old truck lover that I am I felt like I should put my 2 cents worth in when he dissed that fine looking Diamond Reo- if it were mine I wouldn't trade it for 2 Western Stars! So I just told him it sounded like he did all his trucking in the sand box,'til mama called him in at nap time. Well,I know I said soon,but Bill (The Diesel Gypsy) said part of his computer was in the hospital,so it'll be A few more days before he gets the truck show page finished. Hey Paul,nothing on the mixer yet.I don't know where to look,but I haven't seen A name,number,or any identifying marks on it anywhere and nobody's ventured A guess yet either. Sorry to hear of your heart problem Ray. About tickets,I'm just saying I don't mind getting A ticket I deserve nearly as much when the officer is polite,but sometimes you'll run across those who seem to hate you just because you're driving A truck. I've also run across some very nice police officers. A former Sheriff in Nelson County would sit in the median on U.S.29 and talk to us on the radio when we were going to Boston.He'd been known to sit in the dark and when A truck was going too fast he'd turn the blue lights on and the driver knew he'd just gotten A ticket to go along with being scared half to death!Then he'd just say on the radio "better slow 'er down there buddy" and not even move. And the driver probably wouldn't think of speeding through there again,because of the respect for him,so he was effective in his speed control.Now of course it's not about safety,it's all about money-an overlength ticket in this county cost me $306 last December,but that was written by A state diesel cop,not county. At least besides the aching tooth and a heat wave that leaves me drenched in sweat every time I chain down A load or tarp A load,and the fact that it's so dry here -my garden just withered away,and I've only cut the grass A couple of times,last time a couple of months ago-I have A little good news.I left the truck at the Cat shop in Lynchburg last night so they can turn the horsepower up from 475 to 550.You would think it'd make A world of difference,but it's hard to say.The last Cat I drove was A 435 and when it was turned up to A 475 you couldn't tell A lot of difference.I know that's not near as big A jump,but I've taken A truck in to be worked on before,they'll put it on the dyno and check it, get you 20 more horsepower and it was like driving A different truck. I hope that's the case this time-it's A big ol' pretty truck,but it lays down like A big ol' dog when it sees A hill. Just got in ,i've been to Midland City,Al. with A load of beams,reloaded shingles at Peachtree City,Ga. to Oxford,N.C, then loaded Kyanite at Dillwyn,Va. to Negley,Oh,then had a two pick up reload at Ambridge and Leetsdale,Pa coming back to Lynchburg,Va.I was going to drop the trailer in Lynchburg,but I got there at 5:00 o'clock and they went ahead and unloaded me. 'Course I only had 2 beams on. It was still 100+ in Alabama and Georgia Monday,but it was 56 degrees this morning (Wednesday) when I got up in Pa.about 4am and continued on to Negley. I actually turned the heat on for A little while. Had A toothache all day yesterday,but after taking alternating handfulls of aspirin,tylenol,and motrin it wasn't too bad today.Got A dentist's appointment in the morning-actually looking forward to it! Barry,this is great! I really like Ray's blog-if I could type with more than one finger (I actually have many more) I could tell many more stories.Somebody will come up with something and it just triggers memories I'd long forgotten,but you never know,somebody out there might find it interesting. This is A great topic Ray! In almost 29 years of driving I must say that the cops in North Carolina are the rudest and most hateful of any place I've ever been stopped.I hear A lot of drivers complain about Ohio and Virginia,but Ive had little problems with either one.Getting A ticket is much easier to take if the officer is respectful and polite,which they should be anyway,but they're always mean and hateful in N.C.-like they take it personally or something. I'm always respectful and polite to them -not that I get stopped much to begin with-but I don't like to be treated like A criminal just because I'm driving A truck. No bashing,just the facts. The Diesel Gypsy has started on the Troutman show page,so it shouldn't be long now. I remember a smokey helping me one time. I was headed South on the West Virginia Turnpike,driving an F-model Mack.I had A flat tire on the trailer and at the time we ran tube type tires with Dayton wheels,so we could change a tire pretty easily.I pulled into the pull-off where the rest area is now,about the 70 mile marker.There were no facilities there then,it was just a paved wide spot really.Got my jack and tools out and jacked the trailer up when a cop pulled up and asked what was wrong.I told him I was all right,just changing a tire.Then he asked me if I wanted him to shine his spotlight on the wheel so I could see better ( forgot to mention it was night,and dark!) I said "that's all right,I have a flashlight,but thank you".He said"well,i've got to do some paperwork anyway",and he sat right there with his light on that wheel until I finished changing the tire. ...and the heat was everything I expected it to be.The worst was when I reloaded a load of steel going to Petersburg,Va. in Savannah,Ga. Wednesday,and the temperature in the parking lot where I loaded was 114 degrees.That's the hottest I can ever remember being out in.I'm loaded now for Midland City,Al. for Monday delivery.Got in today and took a leaking brake chamber off the mixer,it was a struggle with layers of dust,dirt,concrete,and paint-plus the 100+ temperatures,but i got it off and should get a new one tomorrow to reinstall in the heat! Just got back from Toga,Va.where they had the 5th. annual benefit,for some needy person or persons that they pick from the community.Usually it's someone who's ill or has cancer,and all the money donated and raised from the car show,pig roast,horse shoe tournament,silent auction,games,bands,and so on goes to the people the benefit is held for.It's really a great thing for people to do this.They had one for my wife,who died of cancer in June,2005.They picked two local people this year,and one just recently passed away and the other man has colon cancer.The family of the one who recently passed will still get half of the money,which is also a good thing.I put the mixer in the car show too,as I do every year,because this is one thing I wouldn't want to miss,and haven't so far. it's good to keep old dogs working_they like it,and it's good for them.